Heinzman is your full service street rod shop. We build Hot rods, Muscle Cars and Trucks that are meant to be driven! The Heinzman Street Rod Shop takes great pride in fulfilling our customer’s needs and vision for their cars. The care we take in chassis engineering, body work, custom fabrication, paint, interior and assembly make the difference between a good custom car or truck and a great driving one! 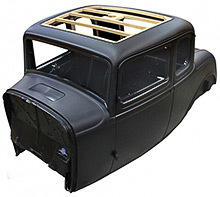 We offer a unique chassis exchange program where we can use your original, sound chassis as a basis for an updated street rod or classic truck chassis. 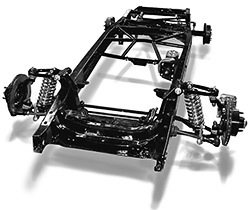 Your chassis is repaired where needed and fitted with leaf springs or four link rear, IFS and disc brakes. There are many additional options such as a Heidts Superide front end, complete plumbing and paint. Please check "chassis exchange" for details. This is a great way to speed up your car or truck project. We also specialize in sheet metal fabrication and restoration, GM LS and Ford Coyote swaps, muscle car suspension and brake upgrades. Check the "services" page for a outline of our shop's capabilities. Heinzman's has a complete line of Street Rod, Classic Truck and Muscle Car parts. We only sell what we use in our projects and know what works and what doesn't. Please check our catalog page where you can view and download our latest catalog or order a printed version. And check our "cars for sale" and "project cars for sale" pages. There may a project waiting just for you! Our "back lot" has many sound bodies and chassis waiting for a new home. Whether it’s chassis fabrication, the body shop, the assembly shop or the office, our staff has one thing in common. We are car people! Give us a call to discuss your dreams.